Please share very widely. We need accurate information out there to counteract the nonsense. They’re at it again. Well, to be more precise, they never stopped – but yet again the unseemly, unbelievable assault on the NHS is being ramped up still further by those who wish its destruction to line their own pockets through lower taxes, company profits, perverted ideology or some poisonous combination of the three. with other right-wing media close behind. Once again, Professor Sir Brian Jarman – the author of the flawed HSMR (hospital standardised mortality ratios) mortality-measuring system is at the heart of it, too, as an advisor to Sir Bruce Keogh, who is overseeing the report, due out on Tuesday, which will supposedly claim the 13,000 deaths. And, once again, the claim is patent nonsense designed to eat away at the roots of the public’s ingrained love of, and respect for, the NHS. It only measures certain sets of deaths, not all deaths. It ignores deaths that happen just after discharge from hospital so that, perversely, a hospital could improve its HSMR scores by sending seriously-ill patients home early to die, or will have better HSMRs if it has a lot of hospices nearby to take patients for their last days or weeks. It is dependent on the ‘Payment by Results’ data hospitals provided by hospitals for financial purposes – data which is often seriously incomplete and for which DFI, the company that compiles HSMRs, offers no training or auditing to ensure that the ‘coding’, the recording of the full range of conditions from which a deceased person suffered, is done correctly. This means that a hospital can suffer from having poor coders (a frequently-cut area for cost-savings), or simply because it reports its deaths more honestly than average. Because of these serious flaws, HSMRs were replaced as the official measure of hospital mortality.by a new system, the SHMI (Summary Hospital-level Mortality Indicator), which avoids some (but not all) of the problems of HSMRs, and therefore give a more accurate measure. The government and its advisors not only selected a measurement known to be inaccurate, but knew it was doing so. It’s impossible to avoid the conclusion that they wanted more hospitals to target, and a bigger headline, than SHMIs would have allowed, and so opted for the inferior system. If you want to read about the ‘NHS 9’ in more detail, you can do so here. If 9 out of the 14 hospitals do not have high mortality at all, then the case that the 13,000 claim is nonsense is already proven. But I won’t stop quite yet, as there are more weaknesses to point out that are fatal to to the death claim. A fundamental problem – and one never highlighted by the media – is that HSMRs are based on measuring an average, not on any absolute standard. If you wanted to know how often people are likely to die from a particular operation or a specific set of medical conditions, you ask the clinical experts, right? Wrong, sadly. HSMRs use a system of averaging – they don’t measure what should be happening, they just measure what is happening. Then they average out what’s happening to come up with a ‘standard’ death-rate and benchmark everyone to that ‘standard’. But that’s a nonsense. By definition, that kind of average will put about half of what it measures above the average line, and about half below it. It doesn’t mean those on the wrong side of the line are bad, just that others were slightly better (or, in the case of HSMRs, possibly that their statistics were less honestly recorded, or that they had several hospices to send patients to, or any number of other reasons not accounted for because HSMRs don’t/can’t measure them). The world’s top 10 kung fu masters come together for a tournament. At the end of the competition, they are ranked 1 to 10. Number 10 is not a bad martial artist – he only has 9 better than him in the world. He’s just at the bottom of the top 10. But if you looked at the rankings in isolation and without understanding the context, you might think he wasn’t very good – until he either kicked your arse, or saved your life from ninjas, and then you’d appreciate how good he was. HSMRs only measure hospitals against each other, not against some absolute, clinically-based standard. So the rankings are extremely misleading, because even if all the hospitals are brilliant, some are going to look bad. To make matters worse, the UK HSMR system does something called ‘rebasing’ – the average line moves every year because the ‘100 line’ (the average point is called 100) is re-calculated based on the previous year’s statistics. This means that even if every hospital is good and then improves further, around half are still going to look bad because they’re on the wrong side of the line. Even if HSMRs were a perfect measure they would still be giving a misleading picture – and they are very far from perfect. If it wasn’t already obvious why the government has opted for the weaker measure, it must be now. It should also already be very obvious that any total of ‘needless deaths’ is nonsense, because measuring to an arbitrary line that can make good hospitals look bad and which is based on incomplete data anyway, is intrinsically nonsensical – and probably based on a malignant hidden agenda. But I’m still not done yet. The raw truth of hospitals is that people die in them. Moreover, people die ‘avoidably’ in them – in every single hospital, in every single country in the world. Globally, in developed countries, the rate of avoidable hospital deaths is estimated to be around 6%. This doesn’t mean the hospitals are killing people, nor that staff are uncaring, lax or incompetent. It simply reflects the fact that care is carried out by people, and people are fallible – and can’t be everywhere at once. Unless we want to pay for enough doctors, nurses and equipment to have a full, fully-equipped team at the bedside of every patient 24/7, that rate is going to remain pretty much unchanged. And even if we did pay, there’d still be avoidable deaths, because healthcare is intrinsically risky, and nobody makes perfect decisions all the time. The only way to eliminate avoidable deaths is to eliminate the NHS – which is pretty much the Tories’ plan. But more people will die ‘needlessly’ – just not in an NHS hospital. Another massive – and again always unmentioned – flaw in the media claims is that the only way to know if a death was avoidable (or ‘needless’, if you’re searching for dramatic impact) is to have properly-trained clinical specialists assess it on an individual, case-by-case basis. ‘Up to 13,000’ means anything from zero to 13,000. But the headline – naturally – uses the most incriminating figure possible. The investigation into the 14 hospitals started just a few months ago. There is no way that any kind of clinical review has been carried out on 13,000 deaths – let alone the hundreds of thousands that would have to be reviewed to find 13,000 ‘needless’ ones. Will some of the deaths in those 14 hospitals have been ‘avoidable’? Certainly – because avoidable deaths happen in every hospital in the world. Did 13,000 people die needlessly? Absolutely not. 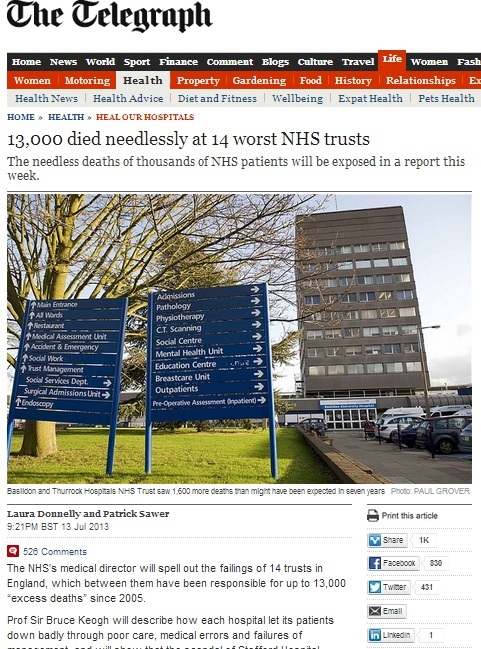 Just like 1,200 people did not die ‘needlessly’ in Stafford hospital (as the Francis report agreed), and just like Prof Jarman’s claim of 20,000 avoidable deaths in the whole English NHS was not worth the paper it was printed on or the bytes it took to upload it. Yet the claims continue, becoming ever bigger and more lurid with each iteration. For such ludicrous, illogical and unfounded claims to continue to be so stridently, incessantly rammed down our throats can suggest only one thing to a rational observer: hidden agendas. Professor Jarman is deeply attached to his HSMR system. It’s his baby – and his baby has been rejected by the NHS because of its inherent flaws. The government has demonstrated an utter disregard for the welfare of anyone who can’t pay for themselves – and in rare moments of honesty and weakness, key players in it have admitted that this extends to the NHS, and that they want it ended. I’ll let you join your own dots. As for me, I rest my case – for now at least. Whenever I see the name Jarman, I just know that what follows will be a pile of poo. Why is this man given so much credibility when the facts tell us his system is unreliable at best & downright wrong at worst ?! Note also how the media are trying to stick this one on Andy Burnham. The SoS for health for a whole 11 months yet somehow he is supposed to be responsible for ignoring problems – yeah, righto…. (rolls eyes)! Don’t know if you have seen this twitter exchange Steve but finally AB responded to Julie Baileys accusations that he ignored problems. I note he left them to continue their unashamed political point-scoring when she accused him of being a failed SoS that sees himself as leader of Labour party. Agree on all points! I saw the Twitter exchange, and in fact jumped in a few times. Yes. Or rather she likes him, because he supports her case. Reblogged this on Ambercycle Consulting. The staff in those hospitals often have difficult jobs to do – they are not going to find it any easier as a result of this hopeless drivel. Hopefully they will find the strength to take the inevitable opprobrium and carry on regardless to the benefit of their patients – patients whose health, confidence and feelings the government clearly doesn’t give a stuff about. Patients just seem to be fodder in the game being played here. Amazing how a relatively small number of individuals can ride roughshod over the needs and wishes of the majority of ordinary people. arghhhhhhhhhhhhhhhhhhhhhhhhhhhhh!! My feelings exactly. Perhaps it’s just as well Sky didn’t have a camera truck available to come and interview me this afternoon..
PS: 13,000 deaths – the police are going to have their work cut out (before they discover there is nothing to interest them). I think you make a very good point… the police are already looking into the staford case, I wonder if they will find any of the “cases” hold up under scrutiny? If they don’t, as I suspect, no doubt it will be quietly not mentioned or will be called a whitewash. in Mail on Sunday as well. 1200 a mid staffs…EVIDENCE????? This is an attempt to destroy the reputation of the NHS in their drive to privatise it! SURELY SOMEBODY SOMEWHERE WILL CHALLENGE AND DESTROY THE FIGURES BEING BANDIED ABOUT – IF AS YOU SAY THEY ARE HIGHLY QUESTIONABLE! SOMEBODY MUST EXPOSE IT…..BUT WHO??????? Here’s the Wikipedia link to Dr Foster – worth having a look at and following the various links contained within it. I’d love to how many of the Ethics Committee have financial connections with private health companies/lobbyists for example? I would also love to know how Professor Jarman’s HSMR system has reached this 13,000 figure in just a couple of weeks? As this government is notorious for lying and has been rebuked by the NAO for falsifying statistics – surely somebody in the Press/Media is going to have the intelligence to scrutinise and validate these mortality figures? How does Professor Jarman’s HSMR system work? How were these figures arrived at? Over what timescale 5, years, 10 years how long? Are these figures accurate or flawed? We need to delve deep, get some expert analysis and find out the truth! Thank you! Brilliant point, too – millions, and the problems represent fractions of a percentage point. Nice to see those with a vested interest in the NHS defending crap healthcare. Good news that Buckinghamshire is in special measures. +128 under SHMI, +110 under SHMR. If “special measures” = help – could be helpful. If “special measures” = closure – not helpful (especially if access to health services is an issue for anyone in the area). I’ve done the math. If we take that 13,000 figure as an average and spread it across all fifteen hospitals, then the true figure of avoidable deaths is closer to 4643. Forgot to add: The sum is 13,000 divided by fifteen, then times by six. I accidentally put fifteen and six in place of fourteen and five, but the final figure still stands after checking it.